Saturday’s County Antrim Post O’Kane Cup final was abandoned due to a serious injury to Harryville Homers player David McWhirter. The Homers striker sustained a broken leg in extra-time of the final against Clough Rangers with the score still deadlocked at nil-nil. A sprint for the ball during the O'Kane Cup final. In a lively opening Clough keeper Colin McCaughern was called into action in the opening minute as he tipped a Darren Campbell shot round the post. Clough started to get on top with Dean Magill and Adrian McDonald at the heart of everything good they were doing and on 25 minutes they almost combined for the opener. Dean Magill swung over a corner from the left and it was met by Adrian McDonald at the near post but his header was brilliantly saved by Ryan Martin. 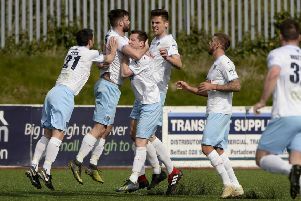 Ryan Stewart then had a free kick from 30 yards out which was well held by Colin McCaughern before Gary Bonnes had two headers late in the half as the half finished goalless. The second half Homers started to exert more pressure with the introduction of David McWhirter giving them more attacking impetus but they were restricted to long range efforts. The best of the second half came with 20 minutes to go when Alan Rainey squared the ball to Gary Bonnes 15 yards out but he shot over with just the keeper to beat. The game fizzled out after this as the match finished scoreless and extra time was to be played. In the eighth minute of the first period the game had to be abandoned when a collision between Clough’s Johnny McCloy and Homers’ David McWhirter resulted in the latter suffering a bad leg break. After a lengthy delay the referee and two teams took the decision to abandon the match and the outcome of the final will now be decided by the BSML council. Everyone wishes young David a speedy recovery and would like to thank the quick actions of the Ballymena Showgrounds Stewards and St John’s Ambulance crew who dealt with the situation. Clough Rangers: Colin McCaughern, Johnny McCloy, David Gage, Jonathan Rice, Steven Gage, Adrian McDonald, Kyle McRoberts, Dean Magill (sub Richard Gregg), Richard Dunlop, Jordan Leighton (sub David Huston), Jonathan Clarke (sub Christopher Montgomery). Subs (not used): Aaron Foster, Stuart Gilmore. Harryville Homers: Ryan Martin, Ricky Nicholl, Ryan Stewart, Ian Russell, David Gibson, Gary Baird, Darren Campbell, Gary Bonnes, Alan Rainey, Paul McNeill (sub David McWhirter), Marcus Spratt (sub Jason Logan). Subs (not used): Jason Ritchie, Ricky Forsythe, Jason McKay. Saturday, January 3, 2015 (10.15am) - Ace Cup, round one: Abbeyview v Clough Rangers (Forum); Carniny Rangers v Connor FC (Wakehurst 1); Harryville Homers v Ballykeel (Wakehurst 2); Michelin v FC Penarol. firmus energy Division One: Raceview v Ahoghill Thistle (Broughshane). George McAuley Cup, round one: Cullybackey Olympic v Cloughmills (Tober Park); Newpark Olympic v Galgorm Blues; St Comgalls v Glenravel; Carnlough Swifts v Riverdale; Waveney Swifts v Braid United (Waveney 2); Holywell v Ahoghill Rovers (Forum). firmus energy Division Two: Lisnafillan Swifts v Seven Towers. CGRSC Sammy Moore Cup, first round, second leg: Steadfast  v Sporting Ballymoney  (Galgorm). firmus energy Division Three: Rectory Rovers v Cushendall (Waveney 1); Randalstown v Templepatrick; Wakehurst Star v Atletico Antrim (Dunfane 1).